I haven’t worked on any restoration projects in a while, and I was starting to get in a slump. So I was excited to learn that my generous stepsister (who gifted me the barn windows I worked with earlier) had some cabinet doors and old frames that she wasn’t going to use. After I find out what I can and can’t paint with during my pregnancy, I’m excited to get to work on them! I searched for some projects on Pinterest to get some inspiration, and I found a couple of really cool tutorials! First, there is this repurposed cabinet door art table for the kiddos, which I love. I don’t think it will work for the cabinets I have, but it’s definitely something I want to try in the future! The tutorial is written by Autie from iCandy on U Create, and it’s complete with instructions and photos! Sometimes I think I’m over all the chalkboard stuff, but then I find beautiful designs like this, and I decide that I love it all over again. I’ve seen cabinet doors turned into chalkboards before, but I really just like how nice it looks when it’s done. I wanted to put up a little chalkboard in the corner by our dinner table and this would be perfect! The entire tutorial with photos is written by Lia on The Elli Blog, a beautiful blog that focuses on weddings but also has tutorials for everyday living! And finally, a beautiful jewelry organizer from Dinah on DIY Inspired. Now, I don’t wear jewelry a lot. I don’t go out very often, and the my daughter broke the necklace that my boyfriend got me literally days after I got it. But I do have a lot of jewelry (and not all of it is costume) and when I do go out, I like to get all gussied up since it probably won’t happen again for another year. So this repurposed cabinet door would be nice to put up in our room or bathroom! 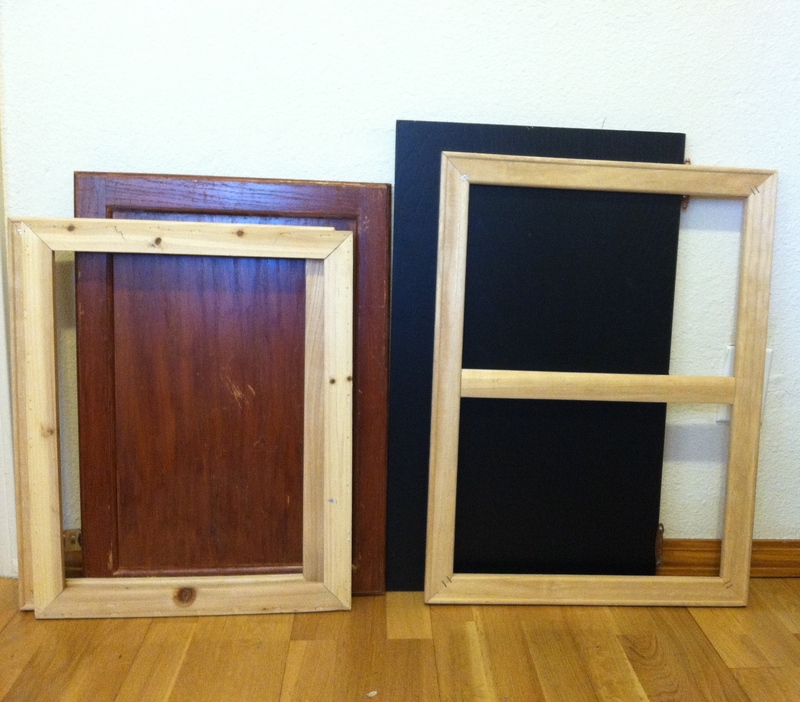 Have you restored a cabinet door and want to share your project? Did you follow one of these tutorials and want to share? Post in the comments and connect with me on Facebook, Twitter, Instagram, Google + and Pinterest! I’m always up for new ideas and inspiration so share em if you got em! If you are into crafting of any kind, you are probably acquainted with Mod Podge. And if you’re familiar with Mod Podge, you have probably read the blog and/or own the book Mod Podge Rocks, by Amy Anderson. I was able to score an interview with this lovely and talented woman from Atlanta, GA and I’m excited to share it below! You have been knitting and sewing for over 20 years, do you remember what some of your first projects were? OH yes! I remember sewing a few things when I was ten. I learned how to make a little jewelry holder with a pull closure, and a rope basket. I made a ton of rope baskets. Haha! For knitting, it was a very lumpy scarf. What inspired you to start your blog? I love to write and I love to share with people, so it was a natural fit. Before I started Mod Podge Rocks, I actually blogged on LiveJournal for a few years, just about my life. I’ve always love crafting, so that was the next natural step. I really loved the Mod Podge logo (still do, of course) and it was the next craft I wanted to master, so that’s how the blog was born. What are some of your favorite crafts/projects you have done? I’m more of a “fun” crafter than a practical one. I like stuff that is very colorful. Two examples are my mustache stool (http://modpodgerocksblog.com/2011/04/imaginisce-circus-themed-stool.html) and my key portrait (http://modpodgerocksblog.com/2010/09/refurbished-key-portrait.html). I also LOVE making jewelry, even though I don’t wear it that much, which is funny. How many hours a week do you think you spend making vs doing businessy stuff? I do about 20% crafty stuff and 80% businessy stuff. Sometimes it’s even less crafty than that. People don’t realize that about blogging – it really changes (the percentage) as you grow. How many hours a week do you spend blogging? I did a time tracker and last week I worked 60 hours. And that was just on the computer. But when you love something, it’s not work, right? How long did it take you to complete your book Mod Podge Rocks, what was the process like? Writing a book is REALLY hard, at least it was for me. It took about 9 months for the whole process, and it was very tiring. I imagine it’s like having a baby . . . and I would be a miserable pregnant woman in that same analogy! I didn’t love the process (creatively draining) but the outcome was worth it! What is your office/studio like? I just moved and my new studio isn’t quite built out yet, but it’s going to be a 1,400 square foot space. I’m so excited! What is a normal (or as normal as it gets) workday like? Any rituals you do every morning, etc? I’m the worst ritual person ever. I really want to become more regimented though . . . I’m all over the place. One thing that remains is that I am not a morning person. I like to get up between 8 – 9 and work on the computer first doing mindless work to get me going. Then I use a task app on my iPhone to tell me what to do next. My goal this year is to get more organized though and have days that I do things – for instance, schedule social media on Mondays, work on crafts on Tuesdays, etc. Do you listen to music while you work, if so…what inspires you the most? I’m a big classic rock fan. But I’ll listen to anything. My boyfriend laughs at me because I can listen to cheesy pop or watch soap operas while I work – it really doesn’t matter. Besides Mod Podge, what are your favorite supplies/brands to work with? I love my X-Acto knife, and I love FolkArt chalkboard paint. I also love Martha Stewart gold leafing recently. It kind of depends on the day. Oh, and I always love knitting, so definitely yarn. What artists have inspired you? Any favorite blogs that you follow? I’m a HUGE Chuck Close fan and I also love Charley Harper. But I don’t really consider myself an artist . . . so what inspires me about them is that they turned a passion into a career. Be honest, how many containers of Mod Podge do you own? What is your favorite kind to work with? You would laugh – I have about 3 bottles. My favorites are Hard Coat and Dimensional Magic – and I don’t even have any Hard Coat right now. Because my living/studio space (that I just moved out of) was so small, I couldn’t really have a lot of supplies on hand. so to have a ton of Mod Podge bottles just wasn’t possible. Just wait until I get into my new space though! Did you have any trouble starting your creative business, any advice you could share? Running your own business is a LOT of work. It’s not for the faint of heart. I am an accountant, office manager, and janitor – among many other roles – in addition to actually doing the work. I wouldn’t say I had “trouble” per se, but it did take awhile to ramp up. It’s not cheap and it’s time consuming. But it’s very satisfying. I would say if you want to be successful, you need to do two things primarily: 1) work hard and often – put the time in; and 2) focus on your OWN work, not the work of others. Nothing good comes out of comparing yourself. There are many other things that go into running your own business, but those are important, at least when you are starting out. What do you do when you need to unwind? Hang out with my dogs or exercise. It clears the mind. I also love to knit. I know, I sound like a crazy crafty lady! Favorite piece of art you own that you did not create? A Charley Harper signed print. I LOVE Charley Harper! Favorite gift to make for someone? I love making mason jar gifts or jewelry. How do you decide on the Contributors for your blog? Do they come to you or do you approach them? I actually had people apply. I love my contributors! What do you see in your future? Definitely doing more consulting, writing another book – then I’m not sure. I should probably get a plan, no? Since I found Mod Podge Rocks in my stash of craft books when I moved, this interview has inspired me to make some crafty creations from the book! I’ll be sure to share some of the projects. 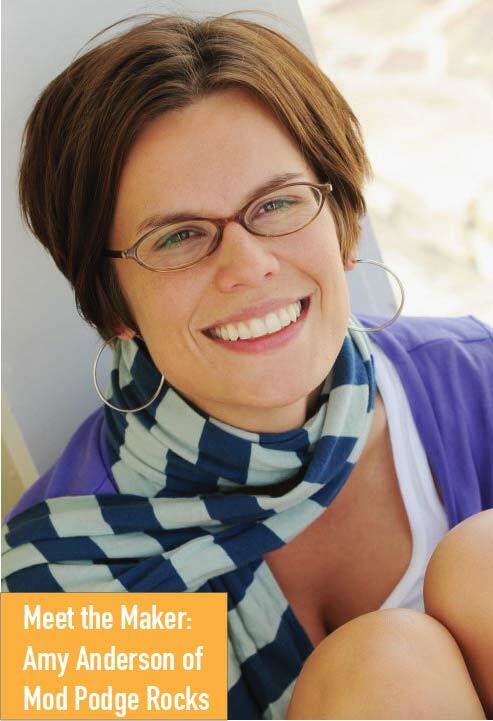 If you want to learn more about Amy Anderson, check out her cool tutorials or see where she gets her inspiration from, check out her blog and connect with her on Facebook, Twitter, Instagram, Google + and Pinterest. If you want to be featured on the Meet the Maker, leave me a comment or e-mail me! You can also find me on Facebook, Twitter, Instagram, Google + and Pinterest. I have a lot riding on February. I have thought about where I want my creative business to go, and everything I have lined up is for next month. 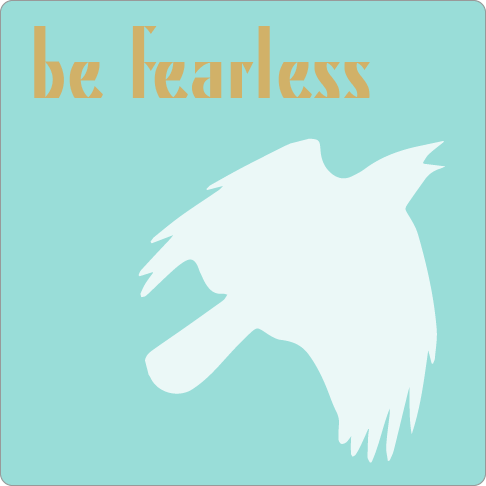 So, February is all about being fearless. I have been waiting for a lot of these changes, and they are finally coming to fruition. I need to put my fears aside and go headfirst into everything I want to do. I’m finally getting a blog update! I’m making the switch to self-hosted, and since I learned my lesson from trying to DIY it last year, I’ve taken another route. I’m going through Amy Cluck-McAlister, who I met when she donated some beautiful and fun jewelry to the first fundraiser I helped organize for Vox. Her site, Amy is the Party, is not only about web design – she shares a whole bunch of crafts, party ideas and spreads some of her local love for Sacramento. So yeah, I love her. After a lot of thinking, re-thinking and some more thinking…I have ultimately decided to start selling Pampered Chef. It’s not a complete DIY approach to running my own business, but it will sure help me get to where I need to be in order to grow my business. It also gives me an opportunity to practice cooking and baking as much as I can, and who doesn’t love them some Pampered Chef? I’ll share the link to my site when it’s up in case you are longing for some cookware. Getting Sweet Mariposa on Facebook and promoting the heck out of our stuff! We have a lot of good stuff up there and I’m excited to share it. I’ve learned a lot about product photography and photo editing through this, and I love that all my projects urge me to learn new skills that have been on my mind for a while. Organizing the fundraiser for Vox. We need to get down the specifics so we can start creating flyers, Press Releases and getting more people involved. This is going to be a whole lot of fun, and I can’t wait to see how it all comes together. Hone in on my design inspiration for my blog and make a dream board specific to my blog. I already have a lot of ideas on my Pinterest, now I just need to pin down exactly what I want (see what I did there?). I need to pick the exact font, colors and theme that I want. This is so exciting! I am beyond thrilled to see what Amy comes up with. I’ve looked at her past work, and I love it. I know this will be good. Get all set up on Pampered Chef. Sign up, get my website set up and then start thinking of some recipes I want to use with all of my fancy cookware! Create a Facebook page for Sweet Mariposa and load all of our photos on there. Connect the page with our Etsy shop for a seamless theme. All of the other social media will be done through my blog account. Meet with Estella of Sol Collective and Eric from Vox. Set a date and time and choose a name. Get started on the sign-up sheet for everyone who wants to get involved. Ok, that should be it! This is all so exciting…I can feel the productivity flying out of my fingertips right now! I know if I can get all of this done next week, I’ll be on a really good start. What are your creative business goals? What do you hope to achieve this week? Share in the comments and connect with me on social media. Let’s ride this sweet rockin’ rollercoaster we call creative businesses together! Today marks the second annual Giving Tuesday – a national day of giving. Since I have worked with nonprofits before, and I know how hard it can be to raise money, I thought I would share some of my favorite nonprofits and different ways you can support them. All of these organizations are run by volunteers who are doing this because they truly believe in the cause and helping other people. That’s kind of an amazing thing, when you think about it. Krochet Kids – I wrote about this awesome nonprofit before, and I am doing it again just because I love them so much. Kohl Crecelius learned to crochet from his older brother, and soon taught his two friends, Travis and Stewart. Though they all went to different Colleges, they would volunteer together in developing countries. After one of the founders, Stewart, returned home from a Summer in Uganda, they were motivated to teach Ugandan women to crochet so they could rise out of poverty. The clothing and accessories are signed by the makers and all of the donations fund their efforts. They recently You can read more about their story here and you can donate here. They recently worked with twin sisters Jennifer and Amy Hood – who founded Hoodzpah – to sell limited edition screen printed posters, one of which is shown above. Out of the Dark – The moment I read about this nonprofit, I immediately felt inspired. This organization was founded by two brothers who work with disadvantaged kids to restore old furniture. They also founded Street Dreams, which they have run for 13 years now, and started this charity as an outreach of that organization. Since I recently fell in love with the art of restoration, I instantly felt a connection with Out of the Dark. Their work is beautiful, and looks super professional. I could definitely see myself buying some pieces – once I have a place to put them. You can learn more about getting involved here and can donate here. Musana – Much like Krochet Kids teaches Ugandan women to crochet beans in order to make a living, Musana works with Ugandan artisans to sell their beautiful beaded jewelry. All of the sales, donations and grants they receive go back into their foundation and helping the Ugandan artisans grow through educational and vocational training. They source their material locally in Uganda, and work with local artisans, academics and professionals. You can find read more about their story and artisans here and you can get involved here. I’m thinking of holding a Musana Market, myself. Sol Collective – Founded in 2003, Sol Collective is a center dedicated to art, culture and activism. I have been to several art shows there and I’ve seen all the work they do inside that building, and I’m always amazed by their passion and determination for their cause. They provide community programs like the Free-Sol Arts Academy – which provides in and out of school art workshops for kids – and the Sacramento Activist School – a gathering of all generations who are focused on social justice issues. You can sign up for a membership here. Vox Sacramento – Even though I only lived a few minutes from Vox when I lived in my dear Midtown, I actually found them through Twitter and decided I wanted to volunteer. When I went to meet with Eric (co-founder), he was in the midst of an art class for kids and was so excited to share his goals with me. I later co-hosted a fundraiser called Art Speaks with my good friend Candice and I have worked on and off with them since then. They are still very dear to my heart, and I hope to work with them more. You can find out more about them here and you can donate here. We all know how tight money is, so even if you can’t donate, nonprofits love them some volunteers. And if you don’t live close to them, ask if you can help with social media and/or sending out newsletters. Trust me, they would love the help! Feel free to share your favorite nonprofits in the comments and on Facebook, Instagram and Twitter with the hashtag #givingtuesday. Check out more awesome people behind awesome causes on my Pinterest.